Zeiss publication: Capitza, HG (1997) Microscopy from the very Beginning 2nd Edn. Cole, RW (2014) Live-cell Imaging Cell Adhesion & Migration 8/5: 452-459. For other resources see the Fluorescent proteins webpage. Also see the Nobel prize lectures, below. Sprague, BL & McNally, JG (2005) FRAP analysis of binding: proper and fitting Trends in Cell Biology 15/2: 84-91. 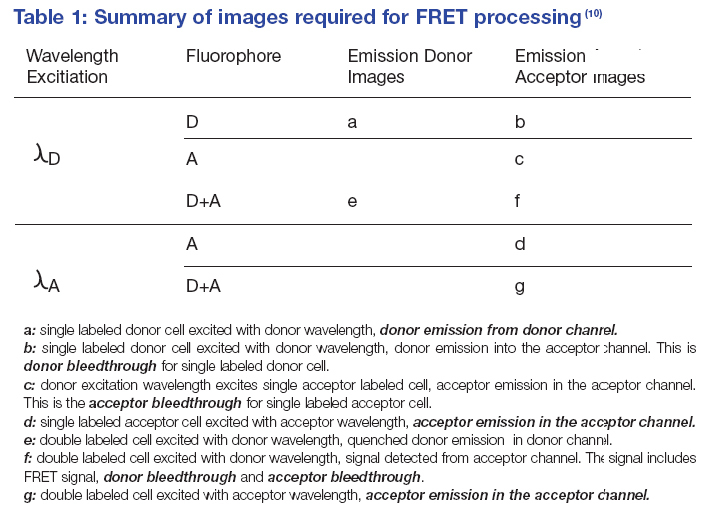 See also the multi-photon spectra on the Fluorophore Databases page. Mattheyses, AL et al (2010) Imaging with total internal reflection fluorescence microscopy for the cell biologist Jour. Cell Science 123/21: 3621-3628. Azaripour, A et al (2016) A survey of clearing techniques for 3D imaging of tissues withspecial reference to connective tissue Prog. Histochem. Cytochem. 51/2: 9-23. Millis, BA et al (2013) Superresolution imaging with standard fluorescent probes Curr Protoc Cell Biol. 60: Unit 21. Sengupta, P et al (2014) Superresolution imaging of biological systems using photoactivated localization microscopy Chem Rev. 114/6: 3189-202. Also see the Nobel prize lectures, below and this commentary. Ossi, J (2008) Light Microscopy Digital Imaging Curr. Protoc. Cytom. Unit 2.3. Bernas, T (2005) Basics of Digital Microscopy Curr. Protoc. Cytom. Unit 12.2. Kloke, J & Hardin, J (2008) Introduction to Statistical Analysis Curr. Protoc. Lab. Techs. Appendix A4 1-30. Not a paper, but Thermo Fisher’s source of Standards; bead suspensions, slides etc. Davis, I (2000) Visualising fluorescence in Drosophila – optimal detection in thick specimens Chapter 6, pp 133-162 in: Protein Localization by Fluorescence Microscopy, VJ Allen, ed. OUP, Oxford. ISBN = 0-19-963740-7 Also see this bead prep PDF from Micron, Oxford. Waters, JC (2009) Accuracy and precision in quantitative fluorescence microscopy Jour. Cell Biology 185/7: 1135-1148. See also the section on Planning an imaging experiment, Chapter 27 of Understanding Light Microscopy. Inoué, S (2002) Polarization microscopy Curr. Protoc. Cell Biology Unit 4.9 See also the biography here. Müller-Reichert, T & Verkade, P (2017) Correlative Light and Electron Microscopy III Methods in Cell Biology vol. 140 Elsevier, Academic Press ISBN: 978-0-12-809975-9 (Paul & Thomas are friends from Dresden days at the MPI-GBG: they amongst the very best in the world at CLEM and electron microscopy). Johnson, E et al (2015) Correlative in-resin super-resolution and electron microscopy using standard flourescent protins Scientific Reports 5: 9583 also see this report on using photo-switchable fluorescent proteins. The Nobel prize in Chemistry has been awarded to those working in microscopy for the discovery and development of GFP (in 2008 to Osamu Shimomura, Martin Chalfie and Roger Y. Tsien) and again in 2014 to to Eric Betzig, W.E. Moerner and Stefan Hell for the development of super-resolved fluorescence microscopy. The Nobel lectures these men gave are worth reading. GFP: discovery by Shimomura (Jour Microscopy article here); Use of the cloned protein as a marker by Chalfie; FP optimisation by Tsien. Super-resolution: development of STED by Hell; development by Moerner of single molecule microscopy and its use by Betzig. NB Please only use the downloadable resources and academic papers on this website for your own personal study and tuition. They are not to be multiply-distributed, or exploited for commercial use. As well as these papers, there is a list of microscopy books which I find helpful, use at work and lend out to others.